john4jack (Corvallis, Oregon, United States) on 5 November 2011 in Architecture and Portfolio. This is the bridge that goes over Latourell Creek. It used to be covered with moss and was much more photogenic. Impressive structure, immersed in this vegetal environment. Crossing the forest! Beautifully done! Lovely close framing. No doubt nature will begin reclaiming the bridge with more moss. Even without the moss it makes a fine graphic subject with structure. Fine shot. Magnificent this bridge in the middle of the greenery, splendid image. Good day. Interesting composition. I like how you chose your frame. Very interesting area. 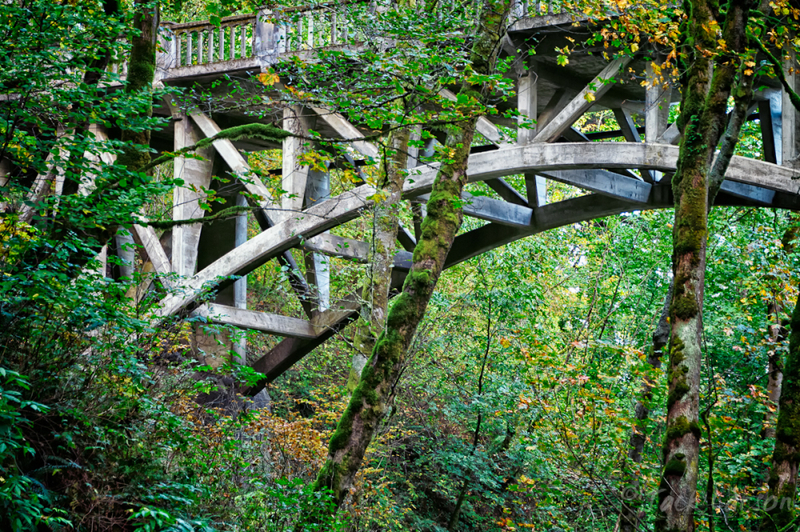 I like the way the lines of the bridge are almost a part of the tangle of the trees. @DULCIE: Yep; clearly not photographers. wood and find where I will be led to by this beautiful find. Beautiful scenery for walking. The architecture of the bridge is beautiful. Nature has reclaimed the bridge. Great capture! I love how photogenic it is even now. Lovely light in there. I enjoy those curving supports. Lovely.